Due to moderate focal length of my telescope (660 mm) I managed to capture two Messier’s object in one shot. 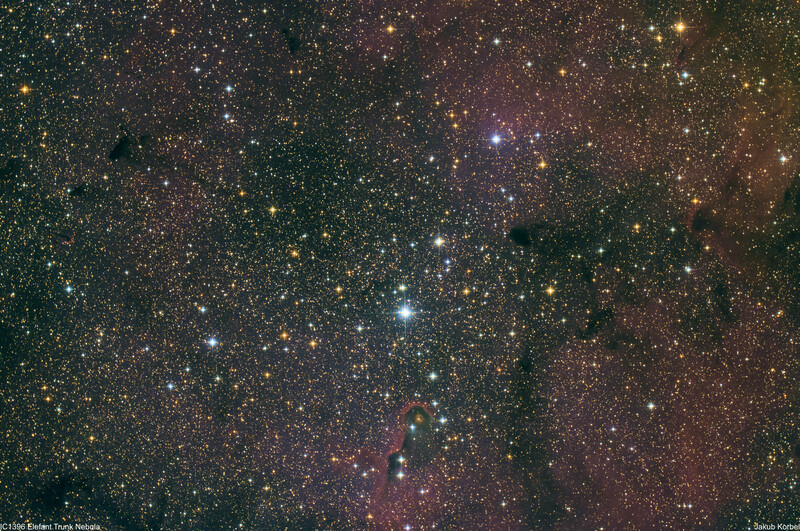 Specifically it was Omega nebula M17 (on the right) and open cluster M18 (on the left). 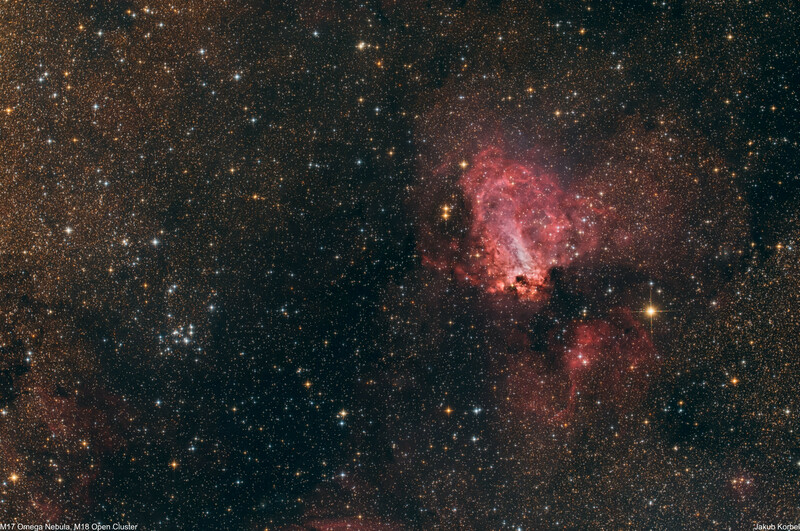 I already captured Omega nebula some time ago, but due to its very low declination, the picture was not that nice. I was really happy that I got the opportunity on island Milos to capture it again. The cluster M18 is approximately 4200 light-years away from Earth and it has diameter 17 light-years. Soul nebula is a beautiful HII region, where new stars are being born. It’s located in constellation Cassiopeia and it’s 7500 light-years from Earth. 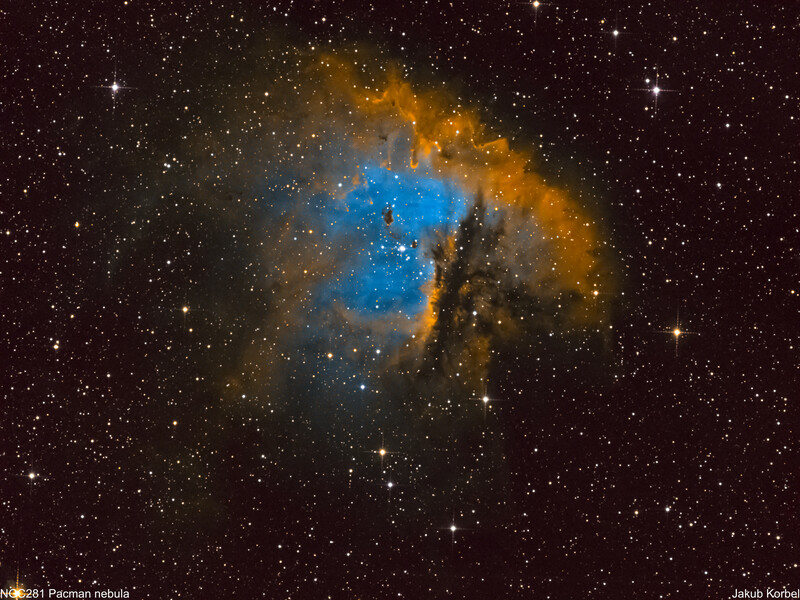 The nebula has neighbor Heart Nebula (IC1805). 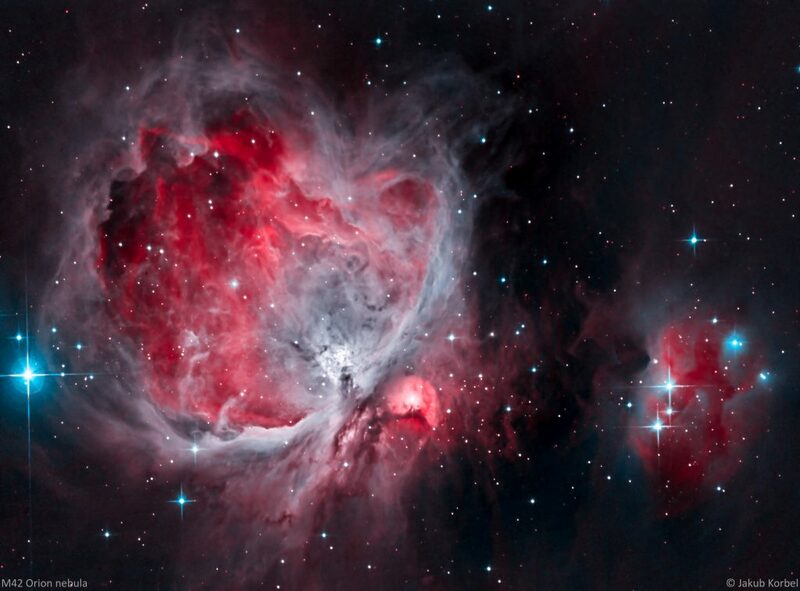 One can say that in this constellation the heart and soul are close to each other. 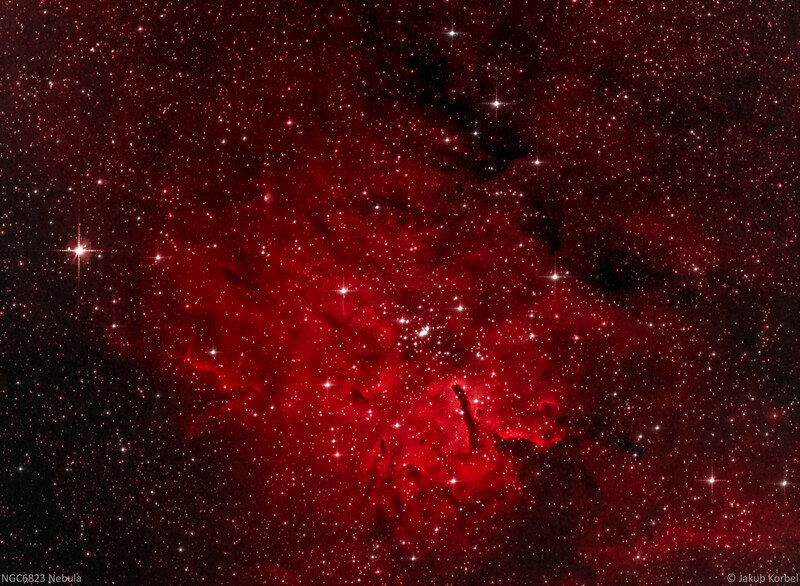 As usual, I used narrow band filters to capture this spectacular nebula. It didn’t fit into ma field of view; this means I would need shorter focal length. Pelican nebula is large cloud of hydrogen gas, where many stars are being born, located in constellation Cygnus (Swan). 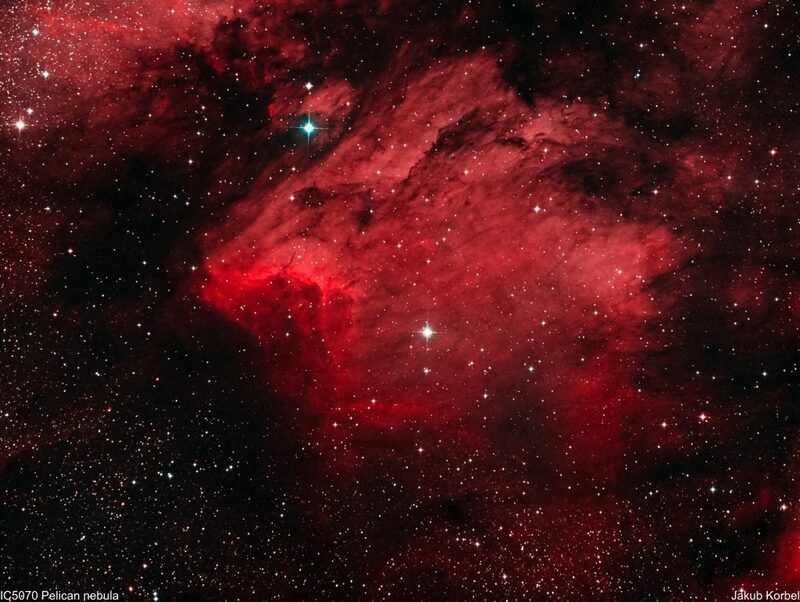 The nebula is approximately 2000 light-years away from Earth. If you use bit of an imagination, you will be able to see the pelican in the dark cloud surrounding the brighter center of the nebula – good luck with searching. 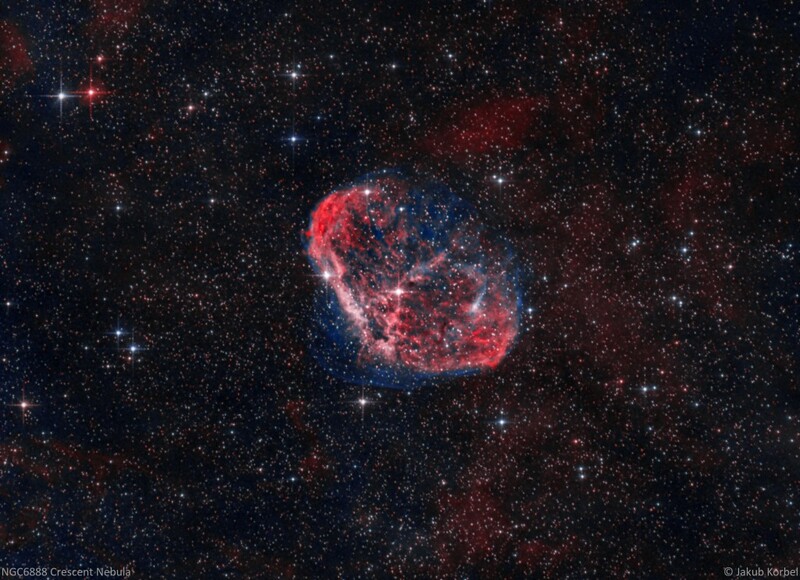 The picture was taken completely by narrow band filters. 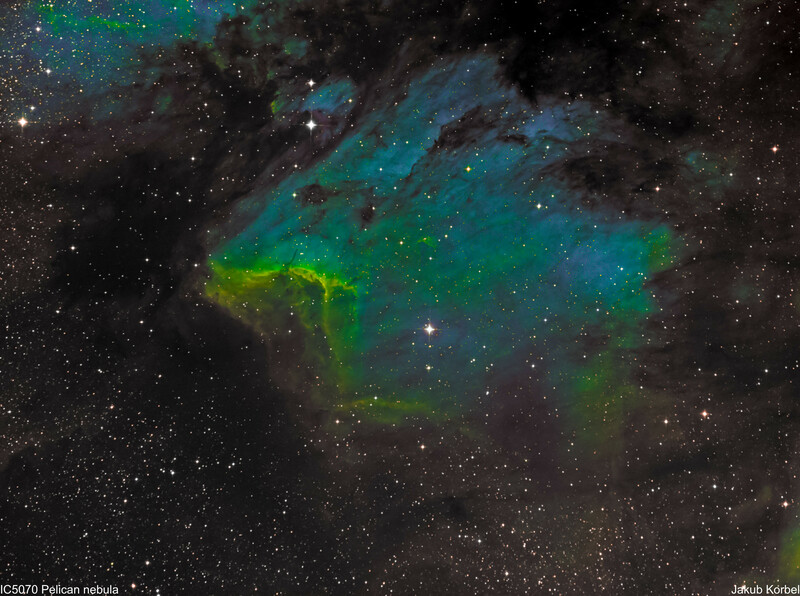 The first one is in “fake” Hubble palette and second one as a bi-color image (Ha in red channel, OIII in green and blue channel). 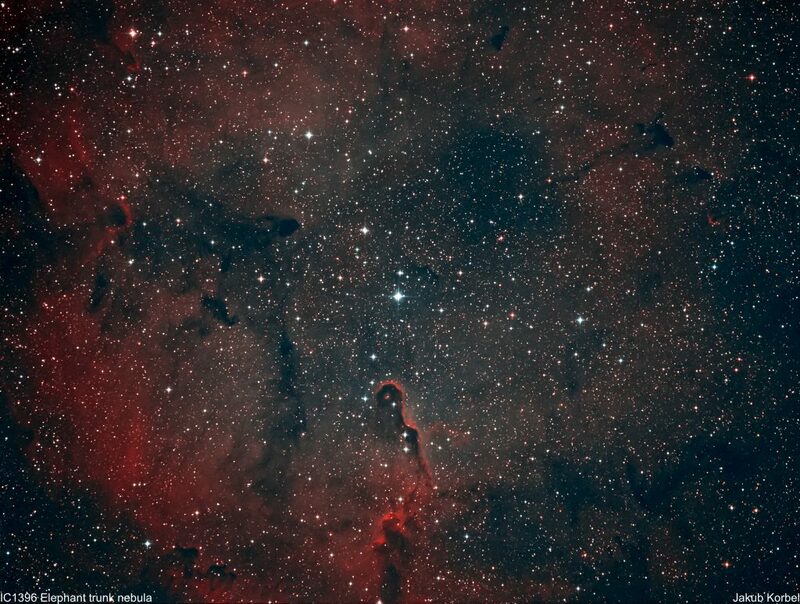 Elephant trunk nebula is visually one of the biggest deep space objects in the sky. It covers more than 6 times the diameter of the Moon. 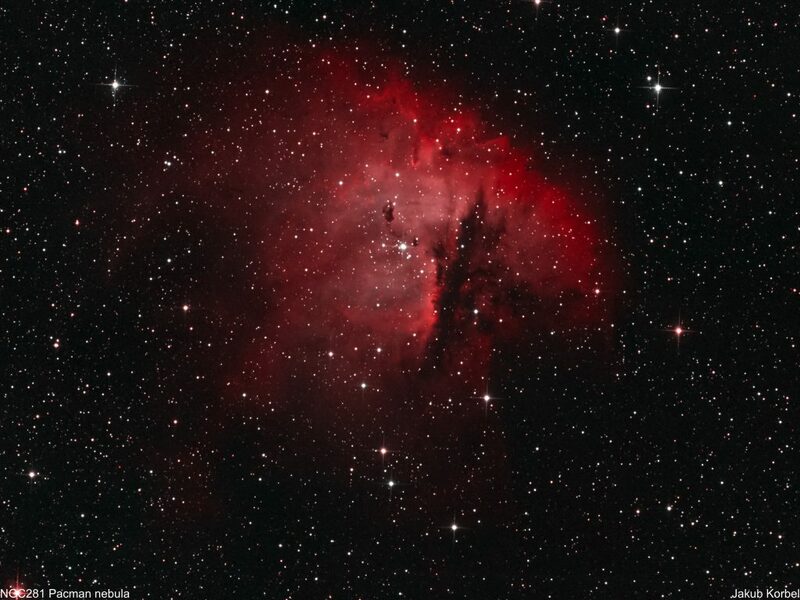 I had to use the telescope with the shortest focal length and use focal reducer ASA 0.73. Recently, I managed to improve the picture quality of this reducer by adjustment of the tilt. 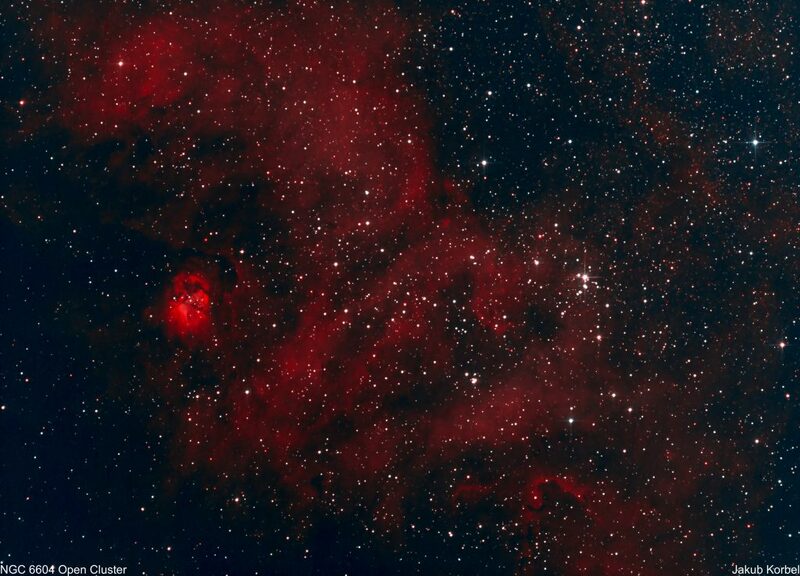 The nebula can be located in constellation Cepheus, but it cannot be spotted visually because it’s very dim. I spent 4 nights capturing these photos. In total, there is nearly 19 hours of exposure time. Probably this is my longest integration time I have ever made. 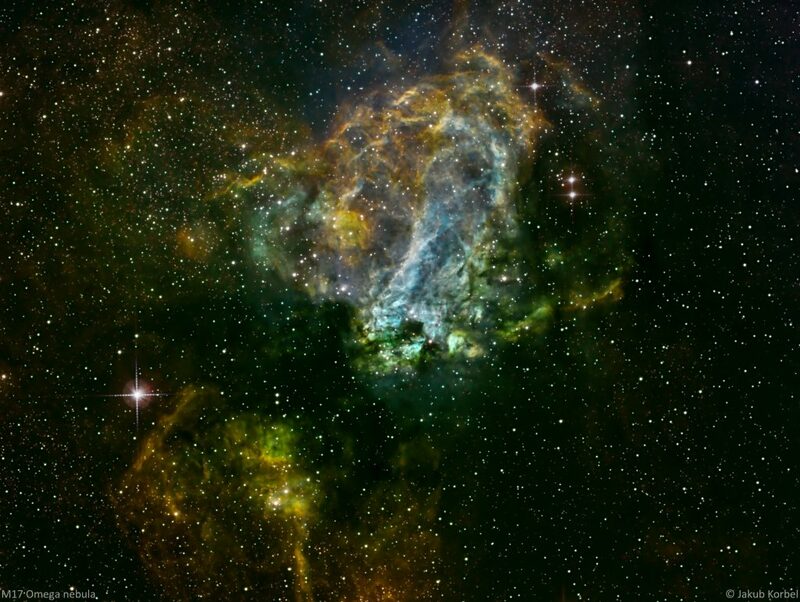 The first picture is in fake Hubble colors, second one in more or less visible spectrum colors. Trifid nebula is a combination of emission, reflection and dark nebula – pretty unique. 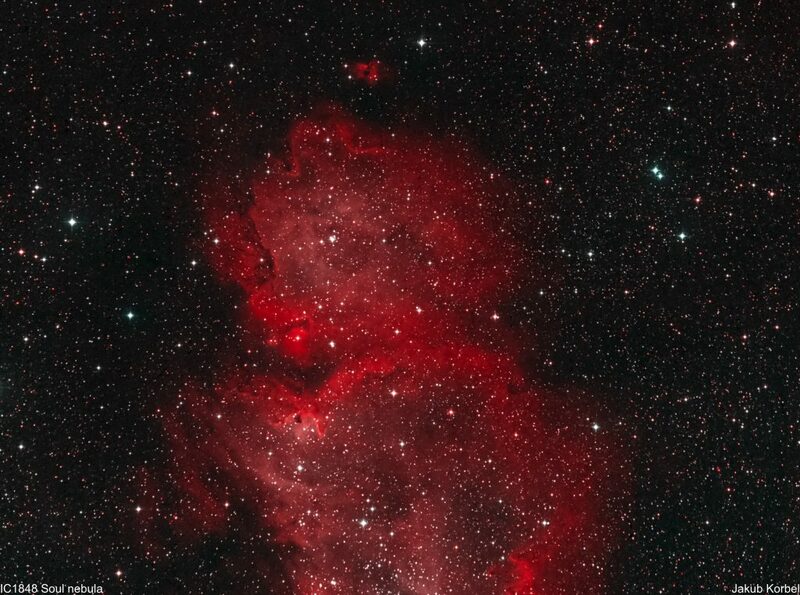 It got its name from 3 dark lines across emission (red) part. 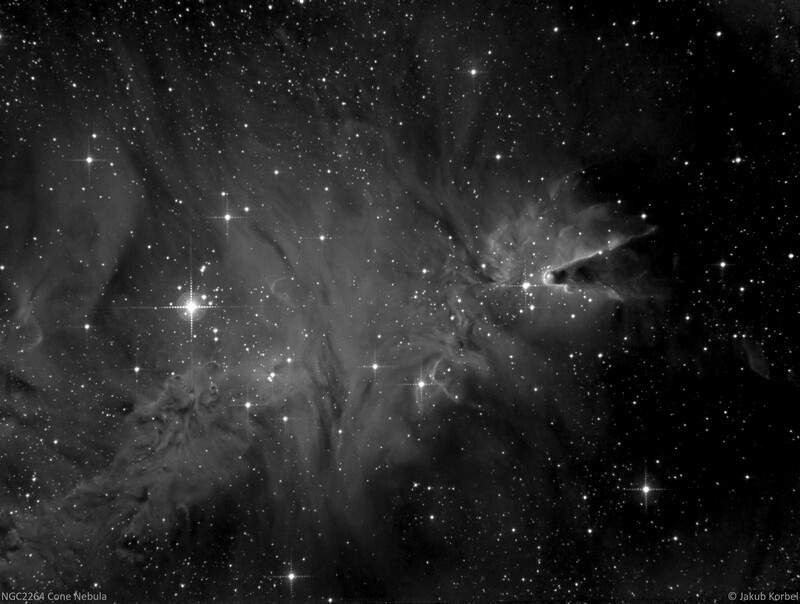 The lines are dust clouds blocking the light emitted by ionized hydrogen. It’s possible to observe this nebula, but one needs dark skies and a telescope with aperture at least 120 mm. 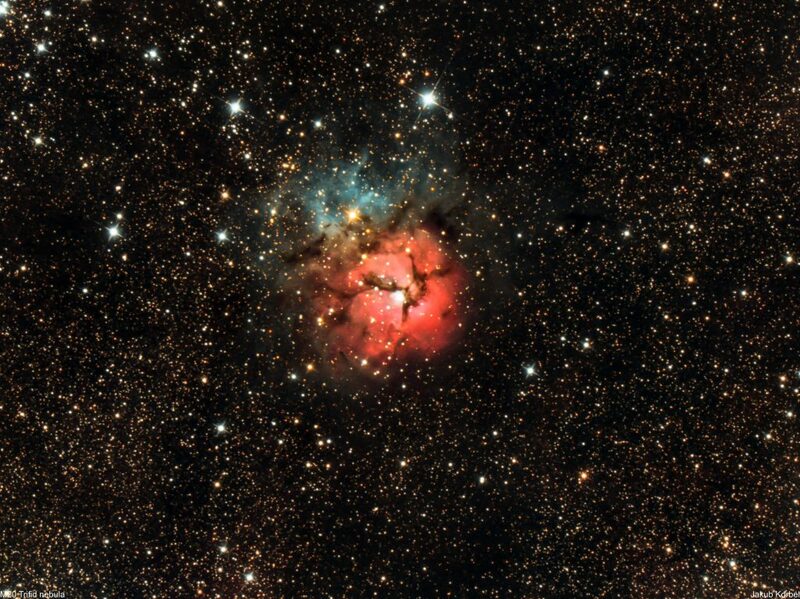 The nebula can be found in constellation Sagittarius and it’s 5200 light-years far from Earth. The picture was taken in Gavdos during my first dark sky chasing. The total integration time is only one hour, which is remarkable for such portable setup. 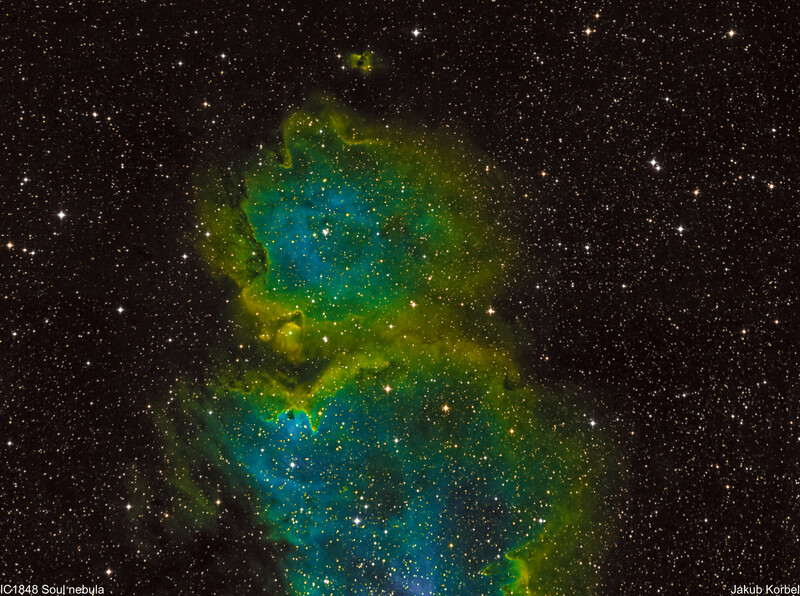 NGC6604 is an open cluster associated with nebulosity. It is located not far from my favorite Eagle nebula in constellation Serpens and it’s 5500 light-years far from the Earth. 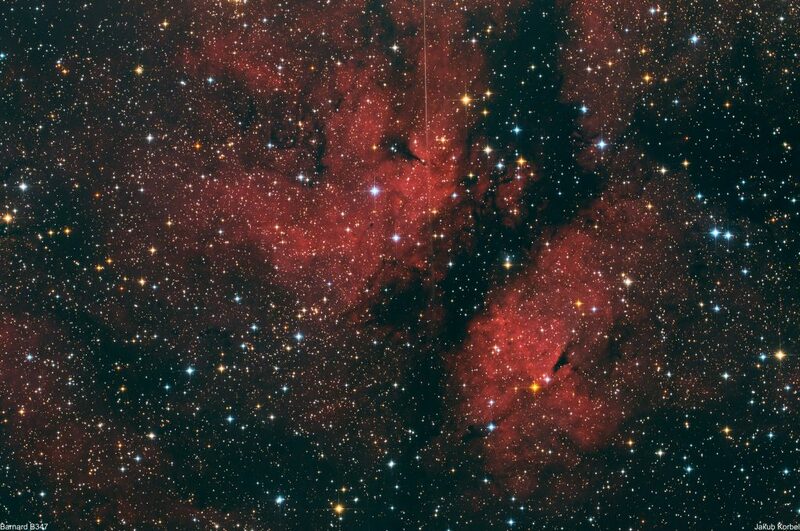 Since this deep space object is not that high on the skies, I rather used narrow band filters, because this part of the skies is strongly influenced by the light pollution, which is coming from the nearest town. 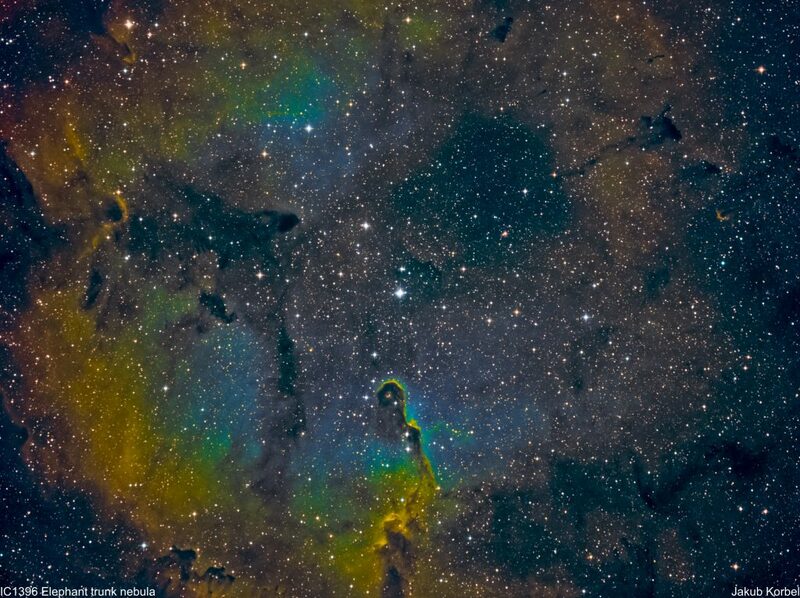 First picture is processed in “fake” Hubble color palette, the second one should more or less look like in “true” color. 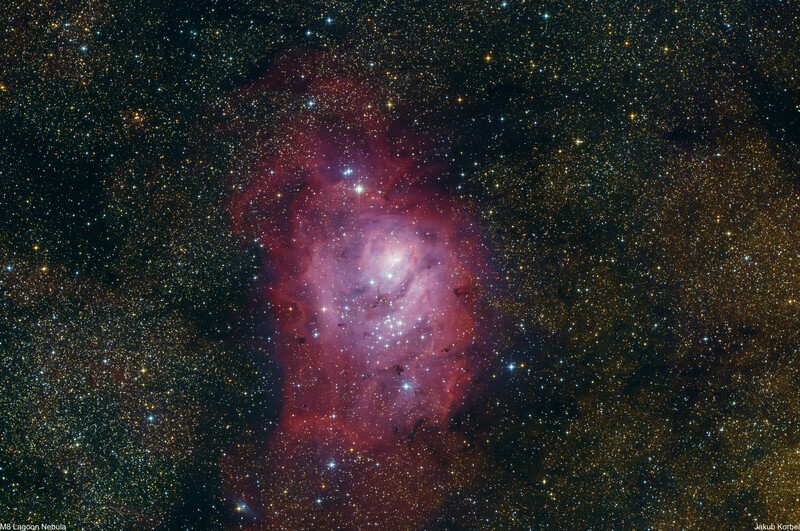 Cone nebula is a giant cloud of ionized hydrogen gas, which includes the Christmas Tree Cluster. It’s located between two bright winter stars Betelgeuse (constellation Orion) and Procyon (Canis Minor) and it’s 2700 light-years far from the Solar System. There is a famous picture from Hubble Space telescope of the tip of the cone – star forming complex. 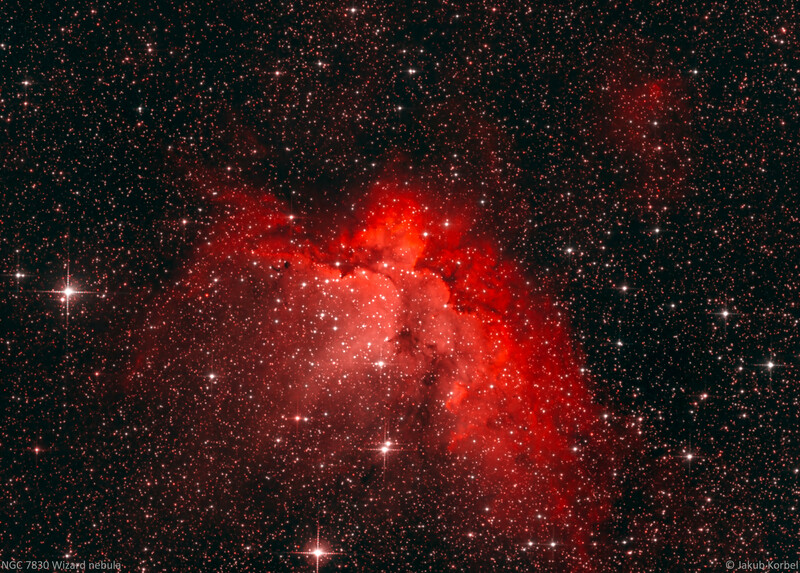 Bi-color picture didn’t look as I expected, therefore I decided to publish only mono version of hydrogen alpha channel. 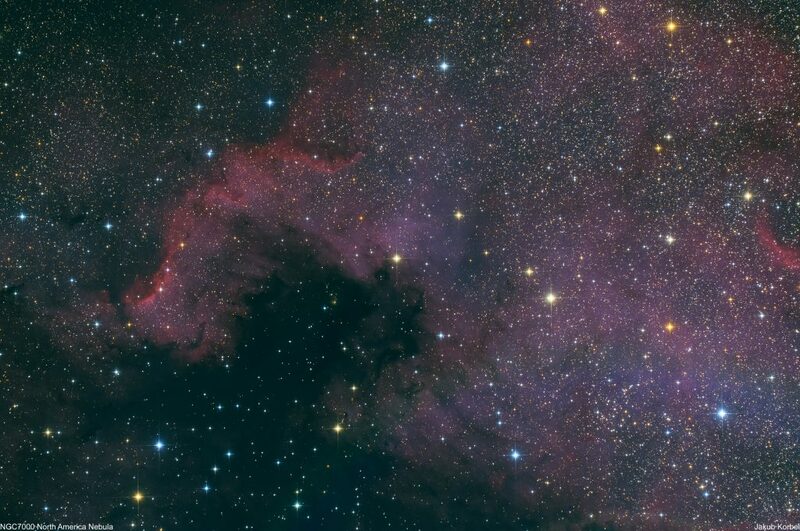 I don’t want to repeat myself, therefore the description on the most famous nebula visible from northern hemisphere can be found here. The previous picture has some strange halo around the bright Hatsya star and I was thinking why. Recently similar picture came out of my telescope and I realized that this strange halo is caused by the frost on the secondary mirror. I manufacture home-made dew shield and I don’t have these problems anymore. This picture is, as usual, composed out of narrow band pictures. When I look at it I am still not happy, therefore I hope next year will be better weather and I will make a better picture. 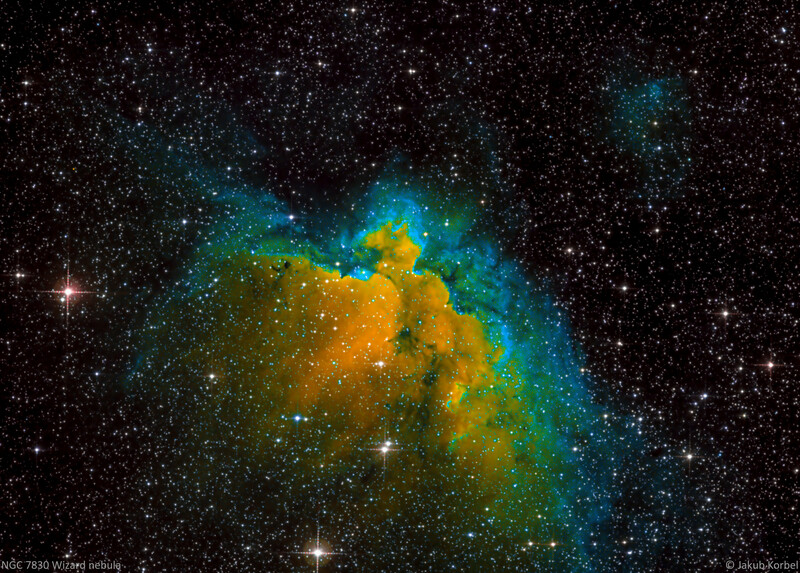 Wizard nebula is an open cluster associated with nebulosity. Visually, it has apparent size of the full Moon, but since it’s very far from the Earth (7200 light years), its real diameter is about 100 light years. So, where is the wizard located? It took me a while to find him, but if you turn your head 90° counter-clockwise, you see two darker hands. It looks like he is trying to grab something. Then above the hands you see the wizard’s conical hat. 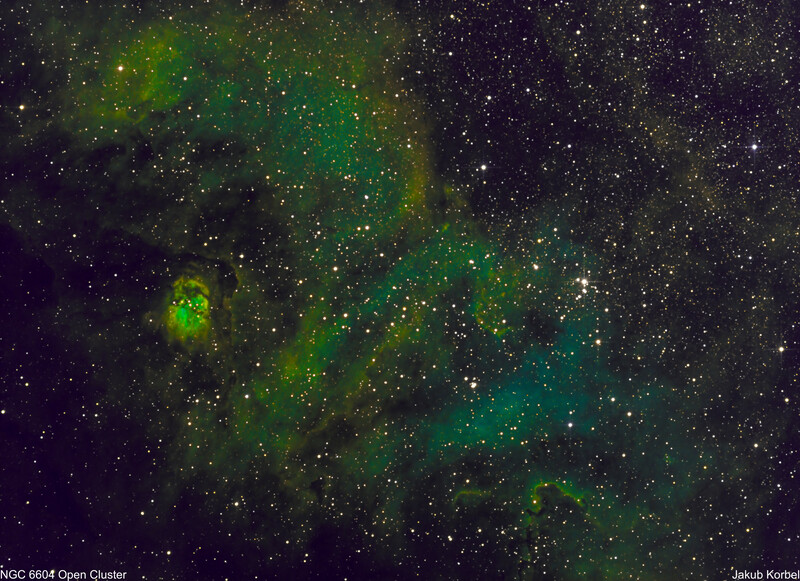 First picture is a composition of 3 narrow band pictures (Ha, OIII and SII) and composed in Hubble Space Telescope palette. Second one is more-or less visible spectrum. NGC6820 Nebula doesn’t have a name, so let’s call it Hidden octopus nebula (because only one tentacle is visible). Hidden octopus nebula is a giant cloud (50 light years in diameter) of ionized hydrogen alpha gas, where new stars are born. The tentacle forms similar structure just like in more famous M16 Eagle nebula. 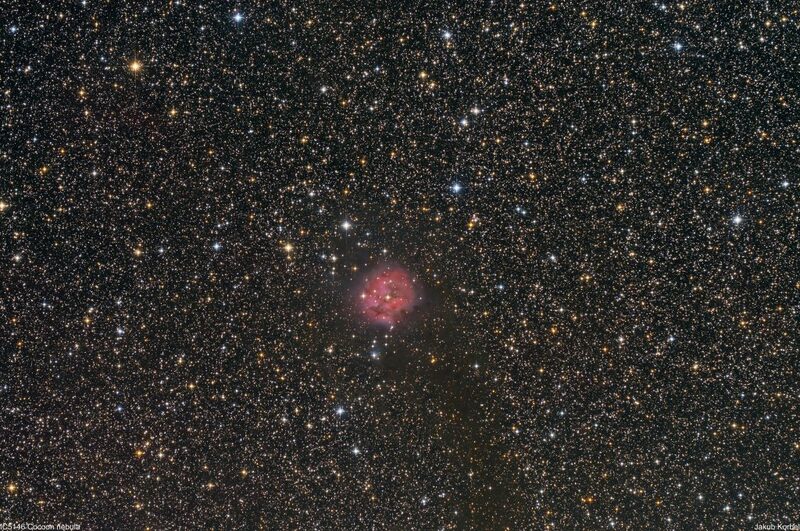 It’s located in constellation Vulpecula (Little fox) not far from M27 Dumbbell nebula and it’s 6000 light year from Earth. The picture was processed in bi-color technique. This means: two narrow band pictures, one H alpha and OIII. H alpha inserted into the red channel, OIII into the green and blue one. 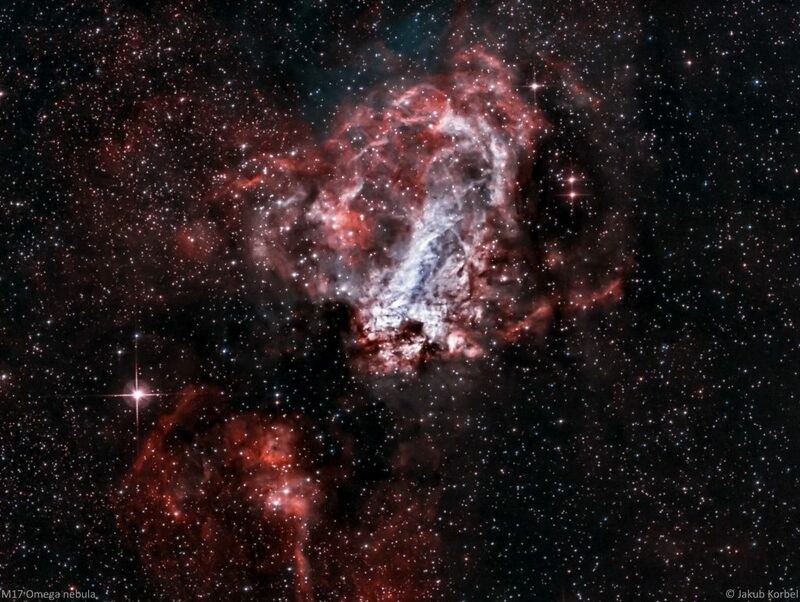 Omega Nebula is a giant cloud of the hydrogen gas where new stars are born. 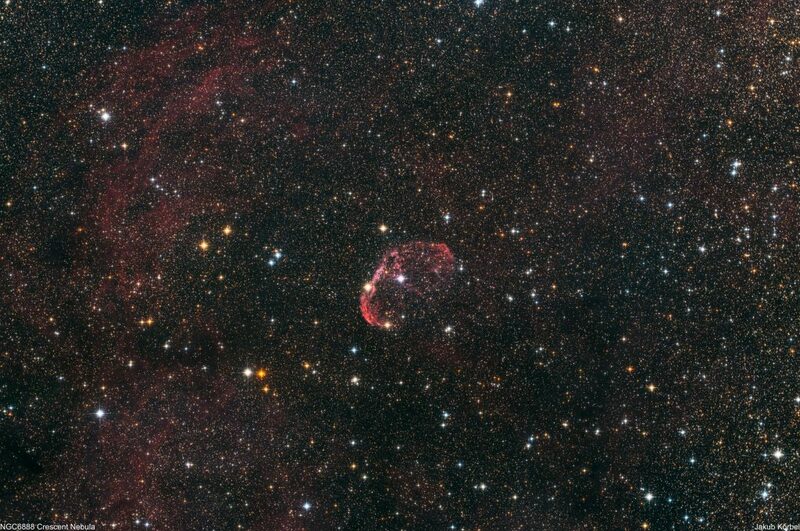 It’s around 5000 light years from Solar system and it has 15 light years in diameter. 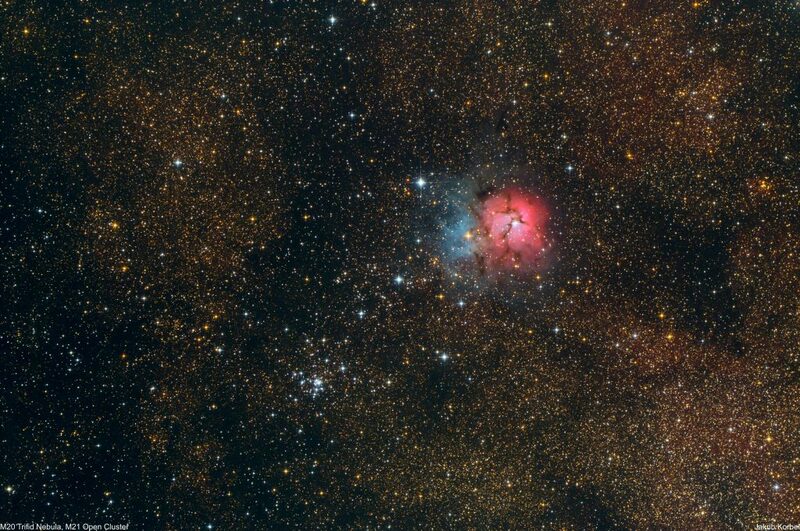 The nebula is located in constellation Sagittarius (The Archer) and it’s the most massive star-forming location in our galaxy. Visual observation is possible, but only with the telescope (medium or big aperture) and from the place with low light pollution.